What was the distribution of radioactive fallout after the 1986 Chernobyl nuclear accident? Ecoterrorism is the term used to describe actions taken by individuals or organizations to prevent what may loosely be termed as “environmental change.” This change may be seen as the clear-cutting of forests for wood products or land for housing or the use of genetically modified plants or animals for human consumption. Ecoterrorists are those who are willing to take violent and potentially harmful action in order to prevent these types of changes. Beginning in the 1980s, industrial sabotage such as tree-spiking (the process of inserting metal spikes into trees so that they cannot be cut down by chainsaws) was used to prevent logging— and tree-spiking can seriously injure the loggers who are cutting down such trees. On April 25 to 26, 1986, the world’s worst nuclear power accident occurred at Chernobyl in the former USSR (now Ukraine). While scientists were testing one of the four reactors at the Chernobyl nuclear power plant, located 80 miles (129 kilometers) north of Kiev, an unusual chain reaction occurred in the reactor. This subsequently led to explosions and a fireball that blew the heavy steel and concrete lid of the reactor. Radioactive fallout containing the isotope cesium-137 and nuclear contamination covered an enormous area, including Byelorussia, Latvia, Lithuania, the central portion of what was then the Soviet Union, the Scandinavian countries, the Ukraine, Poland, Austria, Czechoslovakia, Germany, Switzerland, northern Italy, eastern France, Romania, Bulgaria, Greece, Yugoslavia, the Netherlands, and the United Kingdom. The fallout, extremely uneven because of the shifting wind patterns, extended 1,200 to 1,300 miles (1,930–2,090 kilometers) from the point of the accident. The accident led to the release of roughly 5 percent, or 7 tons, of the reactor fuel containing fifty to one hundred million curies. Estimates of the effects of this fallout range from 28,000 to 100,000 deaths from cancer and genetic defects within the subsequent fifty years. In particular, livestock in high rainfall areas received lethal dosages of radiation. 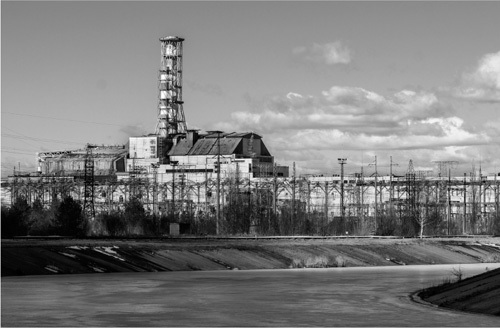 The power plant at Chernobly, shown here in 2012, still sits abandoned long after the 1986 nuclear disaster that killed tens of thousands Soviet Union citizens.